Stefan Zweig’s essays in Messages From a Lost World are a product of his displacement and a sharp reminder to citizens about the agony in the present age of the refugee. In December 1930, Stefan Zweig began writing a biography of Marie Antoinette. He was living in Salzburg, Austria, having moved there from Vienna in 1919 after World War I. He was almost 50 and at the height of his literary fame, living comfortably on the Kapuzinerberg in a large yellow villa crowned with turrets and ringed by high walls. When he wasn’t writing, he was traveling to Berlin or Paris, calling on the artistic celebrities of the day like a modern Boswell. When in Vienna, he went to the opera or lounged in cafés with Sigmund Freud and Arthur Schnitzler. It was a good life lived in the gloaming of interwar Europe. history began making a spoiled darling of Marie Antoinette, who had the Kaiserhof as a home in childhood, wore a crown before she was out of her teens, had charm and grace and wealth in liberal measure…. But destiny, having raised her to the pinnacle of good fortune, dragged her down again with the utmost refinements of cruelty…. Unaccustomed to suffering, she resisted and sought to escape. But with the ruthlessness of an artist who will not desist from his travail until he has wrung the last possibilities from the stubborn clay he is fashioning, the deliberate hand of misfortune continued to mould, to knead, to chisel, and to hammer Marie Antoinette. He was also rich. His father was a businessman who turned a weaving mill in northern Bohemia into a booming industrial success. 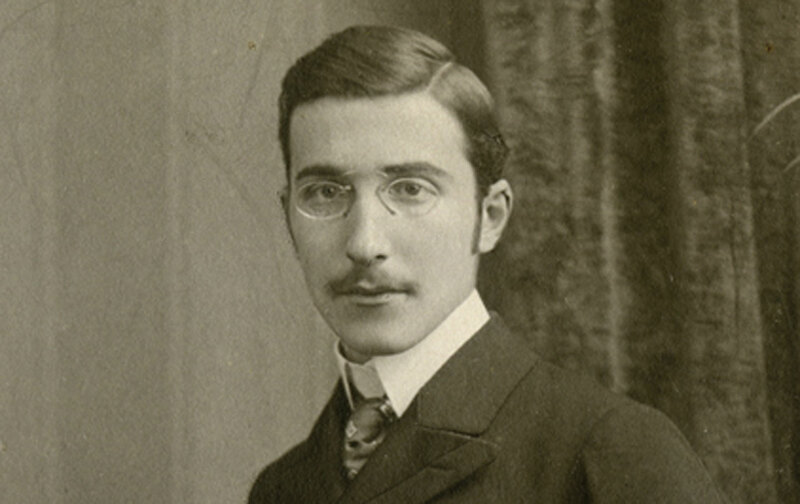 His mother had strong banking connections in Italy, and Zweig inherited a large portion of the family pile in his late teens. His apartment in Vienna was an epicurean domain of rare books set against walls of burning scarlet, of gold leaf dusted into goblets of heady liquor; the rooms were stuffed with the relics of genius, such as one of Beethoven’s desks, as well as cavernous, crimson leather armchairs. Whereas many of his Central European contemporaries sat down to write after spending a long day at the office (Kafka famously worked at an insurance firm), Zweig was able to devote himself to his writing full time. His success as a writer came early. By 1901, while a philosophy student at the University of Vienna (he defended a doctoral thesis on Hippolyte Taine), Zweig became a frequent contributor to Theodor Herzl’s Neue Freie Presse, the capital’s most respected newspaper. Zweig recalled that his first commission felt “like Napoleon presenting a young sergeant with the cross of the Légion d’Honneur.” He enjoyed Herzl’s company and respected his singular commitment to the Zionist cause, but Zweig never subscribed to a doctrine that he thought repurposed the creeds of European nationalism. Zweig was proof that Jews could thrive under the liberal autocracies of late 19th- and early 20th-century Europe. Between 1848 and 1916, there was, according to the historian Tony Judt, “an era of political constraint but cultural and economic liberation.” Jews were excluded from the business of government, but they shared and shaped the high culture of their societies. Joseph Roth’s Radetzky March was a mournful tribute to a dying monarchy that had allowed Jews to flourish. And while Zweig ignored the inner decay of the Habsburg Empire and was tone-deaf to the politics and prejudices of mass society, he too saw Vienna as the tolerant capital of Mitteleuropa’s republic of letters, where universal affinity trumped national distinction. A separate Jewish homeland, with its future “cannons, flags, [and] medals,” was not the answer to Europe’s “Jewish Question”; the city of Freud was. Jews were a fugitive people without a nation, “homeless in the highest sense of the word.” But Zweig thought that the absence of rootedness and the eternal reality of the diaspora were central to the Jewish sense of identity. Doubtful that they could secure their “well-being” through a distinct homeland—one that would lock them into rivalries with other nations—Zweig privileged the “destiny” of Jewish cosmopolitanism. The argument bore a striking resemblance to many Enlightenment theories of Judaism, especially Rousseau’s discussion of Moses and the Exodus in his Considerations on the Government of Poland (1772). The universal character of Jewish existence reflected an overarching internationalism that took shape in Zweig during World War I. In 1914, he volunteered for military service and was sent to work in the War Archive in Vienna. In August of that year, he wrote that Germany must “strike with both fists, to the right and to the left, to extricate itself from the double pincer movement of its enemies. Every muscle of the nations’s magnificent strength is stretched to the full, every nerve of its will quivers with courage and confidence.” (His memoirs pass over this early support of the war.) He became a pacifist in 1914, after he realized not only how violent the war had become—he described it in Hobbesian terms as “the war of everyone against everyone”—but also how long it would keep him from his work. Messages From a Lost World, a collection of Zweig’s nonfiction work, starts at the point of his pacifist turn. The 10 essays cover the years 1914 to 1941, and they’re linked by themes as relevant now as they were in Zweig’s own day: the divisions between open and closed borders, between nationalism and internationalism, barbarism and civilization, tolerance and prejudice, ego and amity, intelligence and ignorance, war and peace. Together, they amount to a manifesto of fraternity in an age of catastrophe. In “The Tower of Babel” (1916), Zweig uses the biblical legend to symbolize European brotherhood: Building a tower to the heavens, humankind proves that by working toward a common ambition, it possessed an “indefatigable” spirit stronger than God’s own (since God chose to rest on the seventh day). Bound in linguistic harmony, human beings continued to build the tower of brotherhood toward the celestial realm, forcing God to impose different languages on them, turning linguistic harmony into discordant melody, division, mistrust, and war. But Arendt was right when she accused him of lacking political conviction. Along with thousands of other intellectuals, artists, and writers, Zweig experienced the harmful and unsettling consequences of what Jules Romains called the “new fanaticisms.” But there was no “Zweigian” take on communism or fascism, no sustained thoughts on the New Deal or on the decay of liberal power and the rise of mass politics. There was, instead, a kind of Olympian detachment from the political sources of discontent. Few artists in Europe showed much insight into the bestial soul of Nazism. Brecht admitted that it was “precisely the vileness and fearsome character of this regime, and the mediocrity of its personnel, that prevented many of us from taking the measure of this evil in all its profundity and shattering significance.” The response to Nazism from liberals, republicans, pacifists, the uncommitted, and even some communists was a fatal mixture of pessimism and retreat on the one hand, optimism and negligence on the other. The first led people to avoid politics altogether and withdraw into the cultural life of their city; the second tempted them to believe that the Weimar Republic could stomach a temporary poison like Hitler. Others, like Klaus Mann, simply laughed at this strange, Chaplin-like figure. Zweig admitted that he was unable to remember when he first heard Hitler’s name (though he did buy a 13-page manuscript of a speech by him in 1933). In the “confused Germany of that day,” where putschists and parliamentarians rose and fell in daily succession, he gave no thought to one more name among many. And as a product of Bildung, he found it impossible to take seriously a man who had never attended university. How could this beer-hall agitator “aspire to the kind of position that had been held by Freiherr Von Stein, Bismarck and Prince Bülow”? Zweig had little trouble producing a mass of best-selling translations, fiction, essays, plays, poems, and travelogues, but he was by no means a great stylist. Writer Leopold Andrian described reading Zweig “reluctantly, a spoonful a day, like a nasty-tasting medicine” in a letter to Hugo von Hofmannsthal, another contemporary author critical of Zweig. But even if Zweig never left us with a masterwork, he belongs to a tradition of exile literature that includes the prodigies of European humanism. But the intellectuals and writers fleeing Nazism also recognized the relationship between personal catastrophe and artistic triumph. In a speech to the PEN Club in New York City in 1941, Zweig said, “Darkness must fall before we are aware of the majesty of the stars above our heads.” As Edward Said observed, efforts to overcome “the crippling story of estrangement” have shaped modern Western culture. In this rich vein, Zweig’s transnational visions in Messages are a product of his displacement, and a sharp reminder to citizens about the agony of being stateless in the present age of the refugee. Some artists, like Bertolt Brecht, cherished formal papers (“The noblest part of man is his passport”). Zweig considered the endless residency permits, visas, registrations, declarations, and questionnaires as a graphic illustration of “the monstrous relapse the world suffered after the First World War.” His reveries of international citizenship, a life of unfettered peregrination much like he imagined existed in Europe before 1914, became the nightmare of Kafka’s Josef K., one determined by the arbitrary will of officialdom. In his belief in a latent “supranational consciousness,” and his conviction that nationalism was the source of Europe’s spiritual decline, Zweig resembled—often knowingly—something like Nietzsche’s “good European.” As Stefan Elbe has shown in his Europe: A Nietzschean Perspective, Nietzsche was among the first thinkers to contemplate the demise of a universal idea of Europe within the secular configuration of modernity. After the “death of God,” Nietz­sche believed, the idea of a common Europe was threatened. Nihilism stood “at the door” of a continent now devoid of the values required for political communion. The “triumph of scientific atheism,” he wrote in The Gay Science, while casting irreversible doubt on the redemptive virtues of Christianity, offered no alternative for an idea of Europe. Theistic decomposition, combined with this absence of an alternative ethos, would result in rival nationalisms. Nietzsche’s notion of “good Europeans” was an attempt to revitalize the idea of Europe without returning to Christianity, or to its rationalized avatars in technocracy and modern science. It was not an identity to be assumed by citizens, but a way of describing a spirit that would reinvigorate a European polis. Zweig wasn’t responding to the clash of ideas posed by the “death of God,” but in writing about the death of fraternity in the firestorm of two world wars, he did shadow Nietzsche—both in terms of his awareness of the deep trouble that Europe was in spiritually and, in particular, in his critique of nationalism as a response to that dilemma. Nietzsche called nationalism a “scurvy egoism” and believed that it merely represented a secular stand-in for God, “the metamorphosis of the cross,” which served only to divide people into hostile camps. The problem of endowing Europe with a new spirit had to be confronted on a “supranational” level rather than entrusted to nations. The tragedy of Stefan Zweig was that he knew that actions alone could overcome Nazism, but words were the only thing he had. a life caught between Pangloss and Jeremiah. Zweig’s message of fraternity is welcome right now. His dream of a united and more humane Europe has been realized to a degree in the exchanges of culture, goods, services, and people under the aegis of the European Union. But even this partially realized version is now under serious threat. At a time of monetary crisis and political disorder, of mounting border controls and barbed-wire fences, when refugees die on the EU’s borders or are subjected to racism and persecution within them, Zweig’s celebration of the brotherhood of peoples reminds us that there is another way. Gavin JacobsonGavin Jacobson is a writer and a book critic. He has written for the Times Literary Supplement, The Guardian, and the Literary Review, among other publications.